I made this recipe completely up from scratch, so I’m quite proud of it. Well. I say I made it up. I had some leftover veg to use up so I chucked it in a pan and decided to see what would happen. 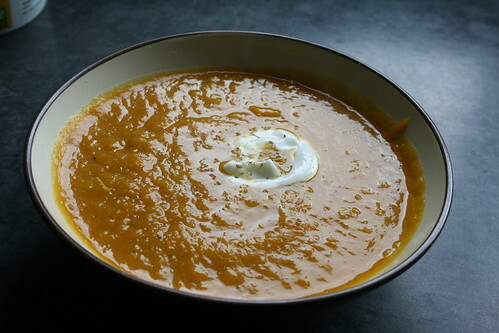 But this worked very well, and I ended up with an extremely yummy soup. Let’s start with the easy bits. 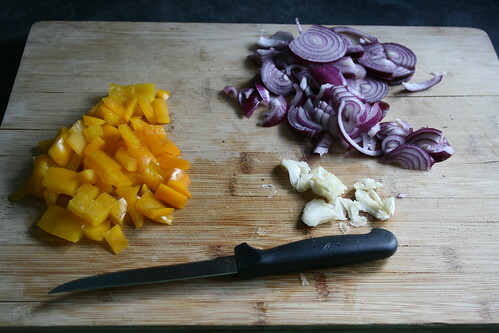 Chop the onions and the pepper, and crush or slice the garlic. So far, so easy. Now to attack the squash. 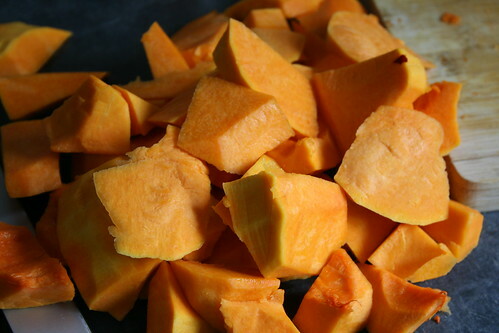 Squashes are not easy to prepare. Firstly, they need peeling. 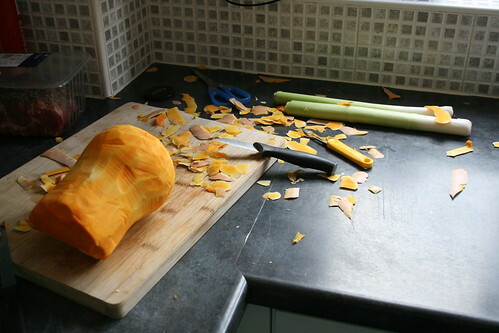 This is what my kitchen looked like after trying to peel the squash. Yes, I used a knife and a peeler. And it was still flaming impossible. Then we have to try and cut the thing into pieces. I achieved this by getting a meat cleaver, thrusting it into the squash and then using that to bang the squash on the chopping board until it went all the way through. 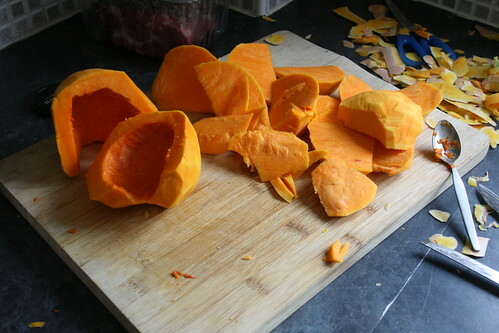 Keep going with this until you get squash in fairly nice, even sizes. 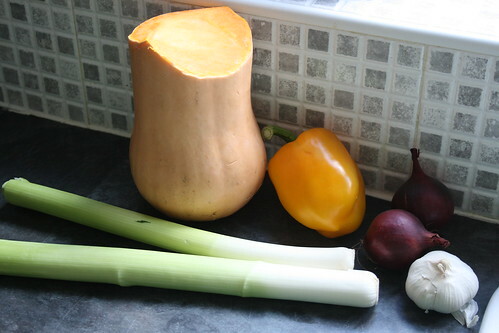 Or, instead of buying a whole squash buy a couple of packs of the pre-prepared stuff from ASDA. Then, slice the leek. 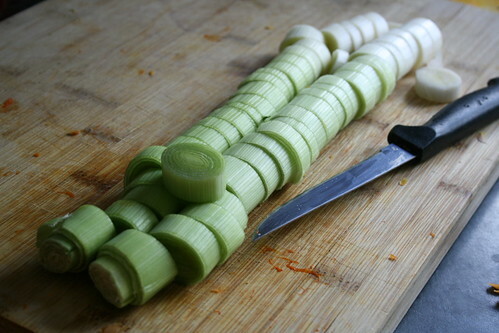 Bask in the joy of how easy the leek is to slice. 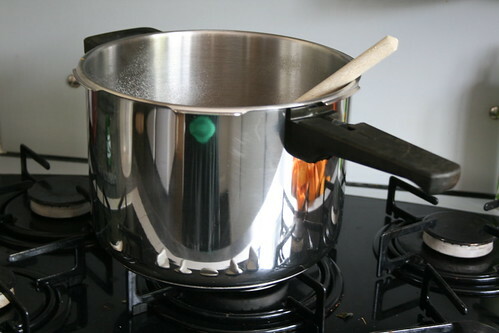 …(that’s actually our pressure cooker with the lid taken off) and spray it with Fry Light. 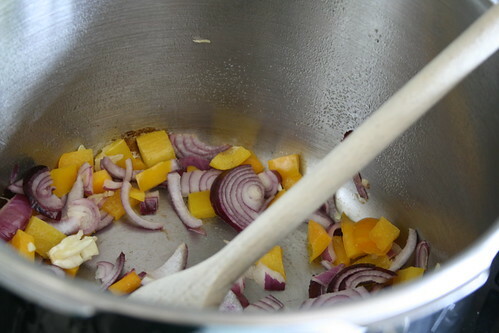 Fry the garlic, pepper and onion for about five minutes, until the onion is soft. 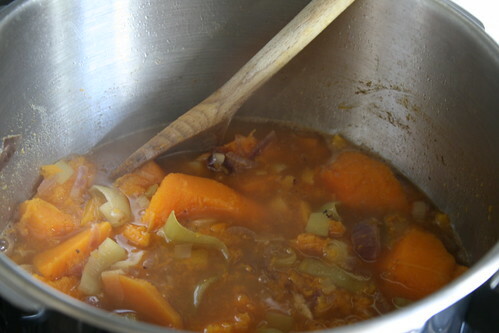 Then add the squash and, for five minutes or so, stir well so that everything is nice and mixed up and heating up. 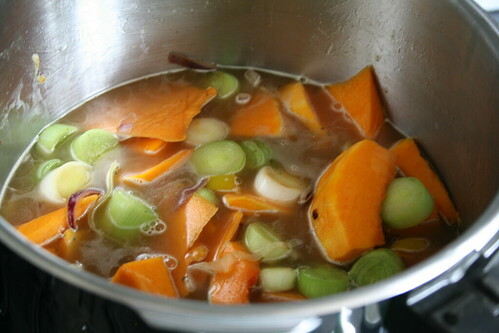 Cover the vegetables in water and sprinkle in two or three vegetable stock cubes. 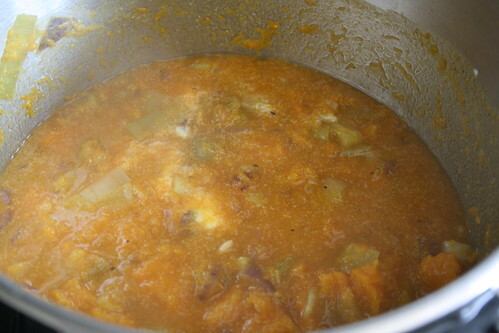 Stir again, cover, and allow to simmer for 20 minutes. When finished, it should be quite mushy. And, when stirred, most of the lumps will disintergrate. 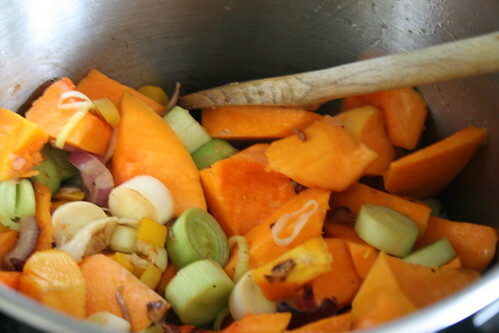 Drain off any excess water (but save it) and then use one of those magic soup whizzers to whizz it up. 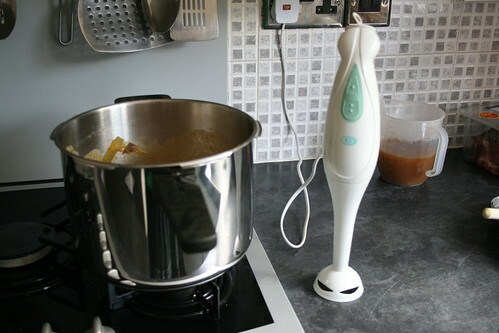 If you don’t have a magic soup whizzer, I’m sure a blender would work just as well. Then gradually add drops of the water, stirring well between each addition, until you get the texture and thickness you like. After this it’s simply a case of pouring it into bowls with a drizzle of fat free fromage frais and a sprinkle of mixed herbs. I spread mine out over a few days in the fridge — I think it’ll keep for about a week if in an airtight container in the fridge. It only lasted so long because there was so much of it and it was so filling — it really was lush.